Well done Tighty, and all the finalists. Amazing work from Tighty and his merry team of updaters. By far the best updates out there *. The whole event looked amazing, wp DTD, top work from the Notts boys to bring home a healthy chunk. * Other updates are available. Congrats to all involved and thanks to those who made it happen! Xavier travelled from Calais to London without a seat and 500 euros to his name on Friday. Won the last chance live sat and turned it into over 200,000 euros. He was a great character too, and a fantastic story for the event. I'll remember the six bet shove with 7-8off for a long time! 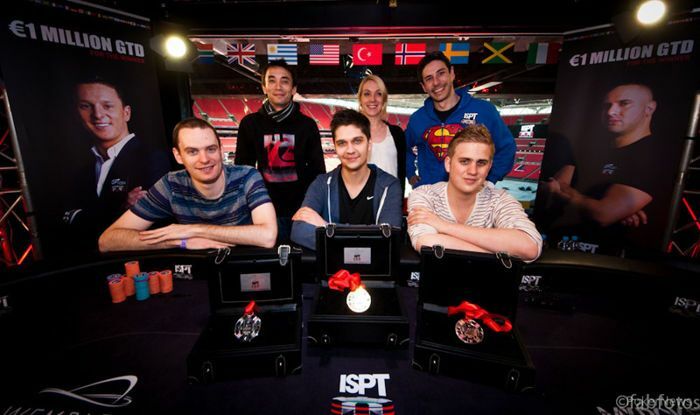 After several days of poker at the magnificent Wembley Stadium in London, Jakub Michalak emerged as the winner of the inaugural €3,000 buy-in International Stadiums Poker Tour (ISPT) Main Event. Michalak is the top-ranked online player in Poland, according to PocketFives.com, and ranks in the top 50 in the world. He would be the first to admit he got lucky in two crucial pots against the aggressive Nottingham-based player Pete Linton, but he backed it up with intelligent and aggressive short-handed play to seal the victory. The tournament final table was moved from the Bobby Moore Suite into a snug Executive Box Suite overlooking the Wembley pitch from a great height. The giant inflatable igloo-like domes that had housed 761 players a few days earlier had been removed, and the field was being worked on for the upcoming Bruce Springsteen concert. Of course, there was no doubt who "The Boss" was going into the final table as Pete Linton was the only player with eight figures in chips, holding just over a quarter of the chips in play. But he suffered a big loss to Michalak early on when they went to war with kings and ace-queen, respectively. Linton remained unperturbed as he and Michalak continued to spar with one another in several pots as they tried to bluff and rebluff each other. Gwendoline Janot was the first player eliminated. She was crippled after losing with pocket sevens to Xavier El Fassy's kings, and was knocked out on the very next hand by Michalak. Frenchman Alban Juen the next out. He'd started the day second in chips but after getting in a raising war against Linton, he was eliminated after losing the flip. After the earlier battles, it was inevitable that Michalak and Linton would get into another big pot, and more than half the chips in play went in the middle as Linton's ace-queen battled Michalak's king-jack. The players took a dinner break, but after only 30 minutes, Nick Hicks, who'd been mostly card dead for the final table and playing snug, was caught when Michalak flopped trips against Hicks' top pair. Michalak went into the heads-up with nearly an 8-to-1 chip lead over recreational player Xavier El Fassy, and it didn't take long for the chips to end up in the middle. El Fassy picked up kings against Michalak's ace-seven but an ace on the flop was followed by another on the river. Echoing the most famous commentary at Wembley Stadium, “They think it's all over, it is now.” Michalak received €236,000 for his historic win at the legendary stadium.